To show many content blocks for such a busy site, we used many in-house modules on homepage. Custom pages such as about us, gallery portfolio, video or sitemap... make SJ Tech highly customized. Content component, and K2 if in need, are supported fully to build blog pages with comments and tags quickly and easily. For developers, it is good to know that with YT Framework, options including colors, menus, typography, short-codes... can be tweaked quickly to suit any need. 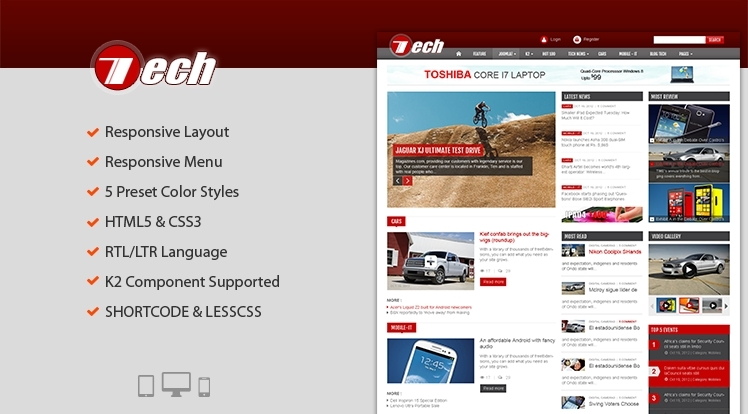 Better than that, we will release SJ Tech for Joomla! version 3.x soon after 2.5.x supported version, any choice is up to you. Let view blog post to feel more!